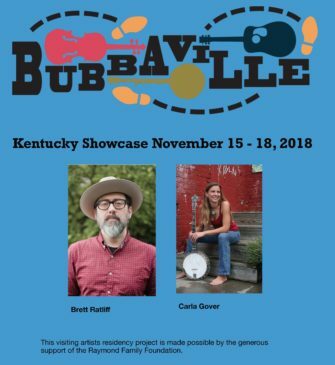 Bubbaville is excited to bring three outstanding Kentucky musicians out to visit local schools, lead workshops and engage with Portland’s traditional music community. Our featured visiting musicians will include Carla Gover and Brett Ratliff and Yani Vozos. 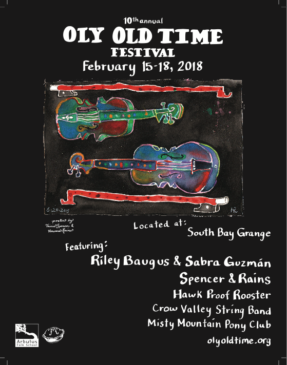 As part of their residency project, these musicians will perform for and visit with students at Roosevelt High School, James John Elementary School, and the BRAVO Youth Orchestra Program. 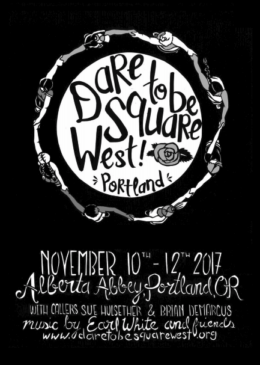 Public events will include the weekly Thursday jam at NW Hostel, a potluck and picking party on Friday, workshops and concerts on Saturday, more workshops on Sunday and a big finale at the Portland Squares dance. For the schedule and artist bios, click here. at Abbie’s on Wednesday, Oct 18th! 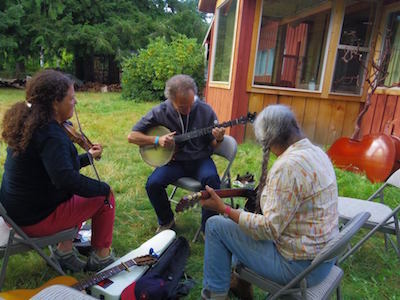 The Zigzag Old Time Music Campout is coming up on Labor Day weekend, September 1 – 4, 2017! Bubbaville is proud to sponsor the visiting featured artists this year: Hen’s Teeth (Jane Rothfield & Nathan Bontrager). We’ll have a local instructors Leela Grace, Steph Noll and Olivia Horgan with us to offer workshops as well, including kid and family activities. 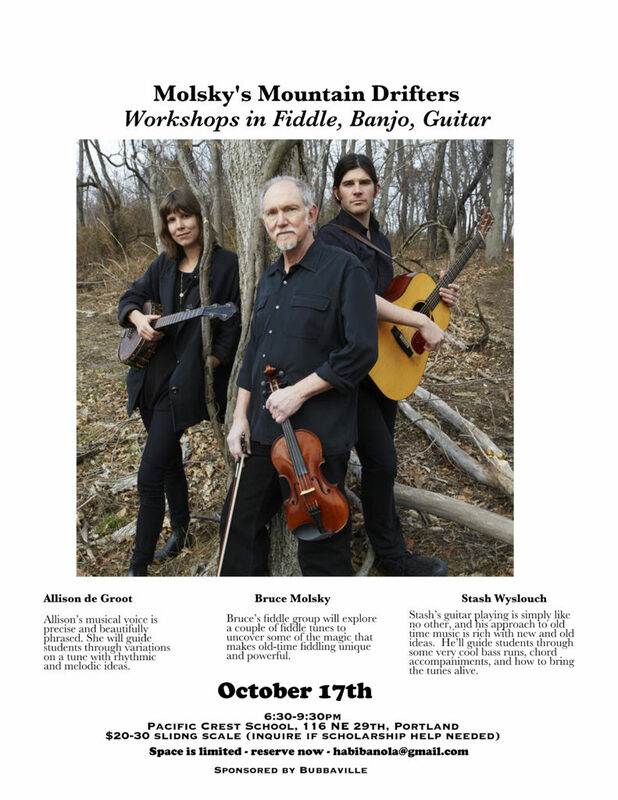 These fabulously talented folks will be offering several workshops over the weekend, and they’ll be around to jam and to play in a concert. 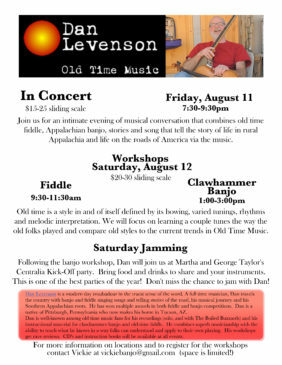 Check out the workshop schedule. You don’t want to miss it! GET YOUR TICKETS TODAY! 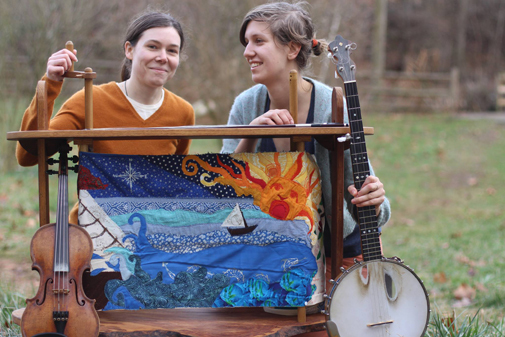 Inspired by the richness and tradition of the music, Anna & Elizabeth gather songs and stories from archives and visits with elders. 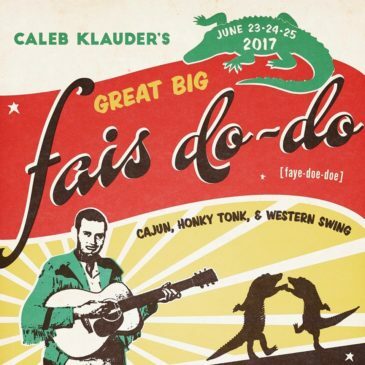 They bring these songs to life in performance with sparse, atmospheric arrangements using guitar, banjo, fiddle, and the uncanny blend of their voices in close harmony. They accompany their songs with stories—of the lyrics, of the singer, of the quest to learn the song—and they illustrate them in mesmerizing fashion. The two revive the old scrolling picture show, dubbed “crankies”—intricate picture-scrolls illustrating the old songs they sing, which they create in tandem with papercuts, shadow puppets, prints, and embroidered fabric. 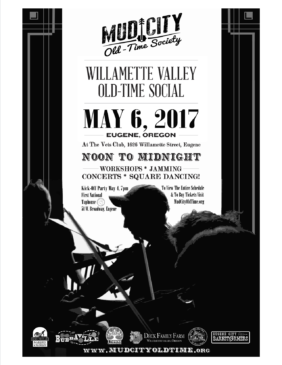 The Willamette Valley Old-Time Social (WVOTS) is an annual celebration of old-time music and dance hosted in Eugene, Oregon. 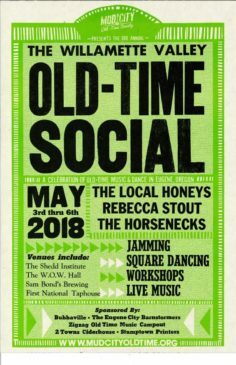 The 2017 social will be held May 4th-7th, and will feature a variety of hot bands, presenters and dance callers from across the region and beyond. 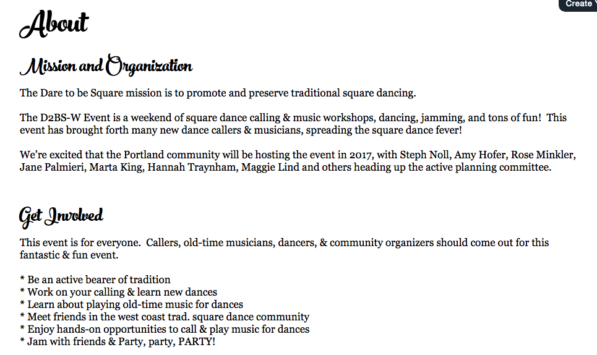 Join us for jams, performances, dances, and workshops! Note that there will be MANY OPPORTUNITIES TO PLAY WITH OTHER MUSICIANS, so bring your instrument and come and jam with us! In 2012, Bubbaville received a generous matching gift of $10,000 to help launch the Bubba Fund – a memorial fund to honor Bill Martin’s legacy. 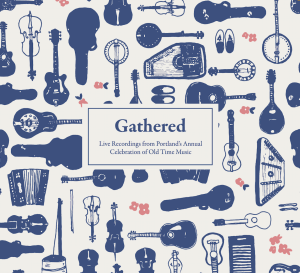 The Bubba Fund will provide support for an array of projects that will benefit Portland’s traditional music and dance community. Many of the projects will be ones that Bill Martin himself dreamed up. We are excited to report that we’ve gotten started on one of the projects Bill wanted his fund to support – the Annual Bubba Award. The first annual Bubba Award was bestowed upon Brian Bagdonas at the 2013 POTMG. Thanks Brian for all you’ve done for our community! 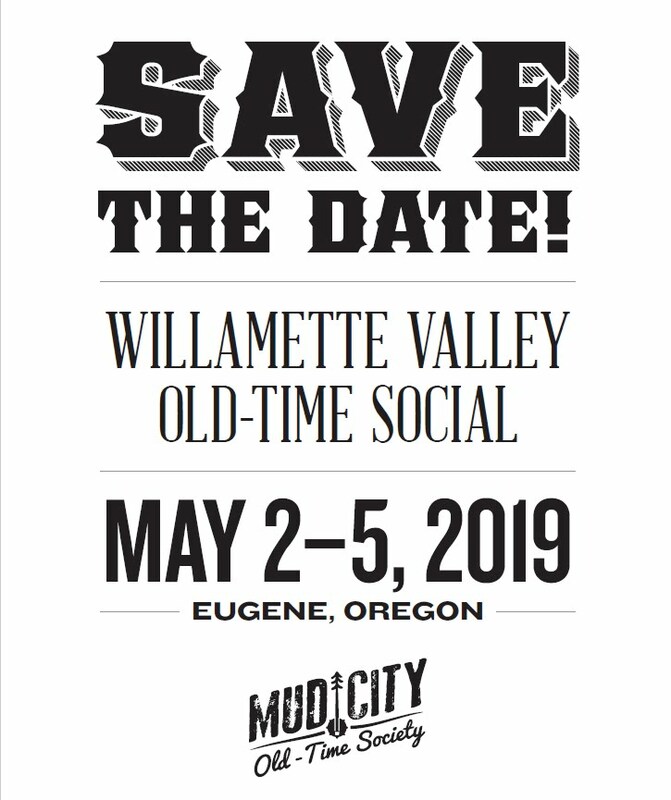 The Bubba Award strives to honor a special person in the Northwest old-time community who has committed a good portion of his/her life to making it a fun, inspiring group to be a part of. The ideal person is someone who may often not be noticed or rewarded – perhaps because he/she serves behind the scenes and does not tend to gravitate towards the spotlight – but who has contributed something unique to the community over the years. The criteria includes – tenure, service, community building, wicked sense of humor and unique sense of style. 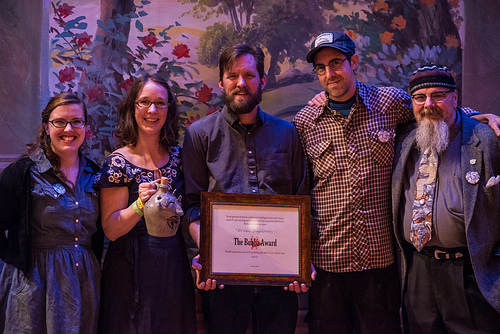 We formed a committee, accepted nominations, and at the Friday night concert of the 2013 Portland Old Time Music Gathering, we presented the 1st Annual Bubba Award to Brian Bagdonas. Missed it? You can read the award presentation speech here!